Roberto Carlos: "Cristiano Ronaldo will be more decisive than Messi"
15.04.2011 » Roberto Carlos: "Cristiano Ronaldo will be more decisive than Messi"
Real Madrid former legendary player, Roberto Carlos, said that Cristiano Ronaldo will be more decisive than Messi in the coming matches between Real Madrid and Barcelona. 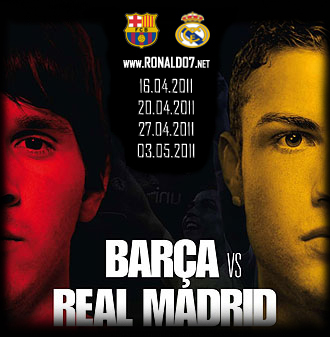 The Clasicos will be decided by details and the all the eyes will be following CR7 and Messi. The Brazilian living legend, Roberto Carlos, confessed he'll also be sticked to the TV in order to watch the Clasicos in the next weeks. The former Real Madrid player believes that Cristiano Ronaldo will have a more decisive influence in the games than Messi. He defends that idea with the fact that Real Madrid is a lot more dependent on CR7 when compared to Barcelona and Messi. Roberto Carlos played almost 600 games for Real Madrid from 1996 to 2007, having won 3 UEFA Champions Leagues and 4 Spanish League titles. Currently playing in Russia, for a club called Anzhi, he can only cheer for Cristiano Ronaldo and Real Madrid from distance. Roberto Carlos: "I really enjoy watching Messi playing, because of the game style he has, but Cristiano Ronaldo can do a lot more for Real Madrid than Messi for Barça. The Argentinian is not the exclusive key player in Barcelona and Real Madrid really depends on Cristiano Ronaldo's performance", said the Brazilian player to the Spanish National Radio. If Barcelona beats Real Madrid, then Roberto Carlos already knows the reasons: "The way Barcelona plays these days, it's pretty much unique. They have fun while playing and make everything seem easy. Even though Real Madrid and Cristiano Ronaldo are getting better, they have receved plenty of critics. Nonetheless, they are already in the UEFA Champions League semifinals and in the Copa del Rey final. If Barcelona wins the game, it surely won't be another 5-0 ("manita"). That only happens once every 10 years or so..."